We have had several requests from folks who would like help creating content they could use as they work to obtain buy-in from others at their institution (e.g., Administrative decision makers, faculty and staff). The PowerPoint file below is one complete presentation that was used for this purpose. Feel free to use all or some of this content as you work to create something that will resonate with your own audience. Please do make sure to keep the GOALS attribution (last slide) intact. Also, please let us know how you are obtaining buy-in, as we would love to share your successes, and methods, with others. If you modify this presentation we would love to see how your final materials speak to your own audience. It may help someone else think through this critical step to get web accessibility work started at their own institution. Over the past year or so, GOALS has been developing a series of cheatsheets to help faculty, staff, and other content creators produce more accessible content. Response to these sheets has been extremely positive and we plan to continually update these resources as new techniques and technologies become available. We have recently reorganized our main cheatsheet page by type of technology (instead of date published) and have just created a new cheatsheet for Acrobat XI. As the popularity of these resources continues to grow, we wanted to take a minute to cover how we believe these resources should (and should not) be used. During my first year of college I had a professor who took great pride in his difficult tests. However, he did allow one single-sided sheet of handwritten notes. I remember spending a tremendous amount of time copying text in the tiniest size I could manage until I was confident the sheet contained every bit of possible information. I’m sure most of you can guess the outcome—I spent most of my time looking up every answer and struggled to finish the test before time ran out. During the next test I filled the sheet with about a third as much information, things like unfamiliar names and specific dates. I trusted in my familiarity with the concepts and used the notes to help recall details, and did much better. While developing the GOALS cheatsheets we have the same rule—each resource must fit on a single printed page. We almost always have to cut information that we would like to include, but we feel this design decision is part of what makes these resources helpful. They may not provide all the information (the Adobe guide to Acrobat XI accessibility is a 90+ page PDF), but they provide essential information that people are likely to forget or overlook. Just as a real life cheatsheet won’t get you a good grade on a topic you have never studied, our accessibility cheatsheets will probably not provide enough information for users who are completely unfamiliar with accessibility (even though we know they are sometimes used this way). We have found that they are very useful as handouts at a face-to-face training or as downloadable resources on a support page with additional tutorials. Hopefully they can fill a similar role at your institution. An institutional commitment to accessible online content must start with the content creators. At most institutions, content usually starts with Microsoft Word. 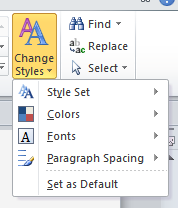 While there are several things content creators can do to improve the accessibility of Word documents for individuals with disabilities (see our cheatsheets on Word for Windows and Word for Mac for specific examples), I am convinced that the single most important thing that they can do to enhance the accessibility of their documents is to start using true headings in Word (headings that appear in the Styles ribbon). In most documents sighted users rely on headings to scan through the document and navigate to relevant sections. Using true headings provides this same functionality to many users with disabilities, especially those who are blind. However, this can be quite an adjustment for someone who is used to creating headings by selecting text and making it bigger, bolder, underlined, centered, etc. Below I offer a few reasons why using true headings will make life easier not just for individuals with disabilities, but for you, the document creator. It usually takes at least three steps to create false headings: change the text size, add bold or italics (or both), and select a different font. Adding a true heading is much simpler—just select the correct button from the Styles ribbon at the top of the page. If you are a person who likes to use keyboard shortcuts, you can also create heading levels 1-3 by pressing Ctrl + Alt + 1, 2, or 3 (command + option on a Mac). Once this shortcut becomes habit it can save a considerable amount of time. Second, if you would rather tweak the appearance of an individual heading level (e.g., you would like your h2s to be italicized), you can accomplish this in Windows by right clicking on a specific heading in the Styles ribbon and selecting Modify. You can even do the reverse—select a block of text that has been styled correctly, right-click the desired heading in the ribbon and choose Update [your heading] to Match Selection. On a Mac you would select the icon to the right of the Styles menu with hover text of “Manage the styles used in this document.” This enables you to modify any part of your heading to achieve the style you desire. While it does take a while to learn your way around these different options, it becomes a tremendous time saver. If a document has a correct heading structure, Word can also create a table of contents for you based on the document’s heading structure. In Windows, go to the References tab and select Table of Contents. On a Mac, select the Document Elements tab and then you can directly select the Table of Contents in the format you would like it to appear. You can also customize the table of contents to change its appearance or choose which heading levels will appear (e.g., Heading levels 1-3). If you make changes to the document that affects page numbers within the table of contents, you can always go back to it and choose Update. There’s a reason your 5th grade teacher taught you to start your essay by creating an outline. Documents that include headings from the start tend to be more consistent in their structure, easier to follow, and even better written. Your readers will be able to read and navigate your pages more efficiently if they can come to expect a consistent heading structure, and I am convinced that you will find it easier to write the document as well. Video can often convey emotion and information more effectively than a static article. It can be an engaging way to start a presentation or to demonstrate a complex task. However, finding the best video for a certain topic can often be very time consuming (trust me!). While there are many great videos online, many of the videos on this topic present misinformation (e.g., the wrong way to add alternative text in MS Word) or are presented without captions themselves. This post includes links to the most accurate, engaging, and accessible videos that I could find after hours of searching. Unless specified otherwise, videos are captioned and are found in YouTube. People are far more inclined to make their content accessible once they realize how their design decisions can help real people with disabilities. If you only have time to share one video, make it a firsthand account from a user with a disability. Students and faculty with disabilities share their frustrations with inaccessible web content in higher ed as well as their optimism that things can improve. Three users with disabilities (blindness, quadriplegia, deafness) demonstrate their frustrations with inaccessible web content. The technology used is a bit dated, but the experiences are very relevant. The first half of this video (especially the first minute) provides excellent examples of students and faculty with disabilities. This is a fabulous resource for web developers and other more technical individuals. It explains the four principles of accessibility that form the foundation of the Web Content Accessibility Guidelines (WCAG) 2.0. It has dozens of examples of users with disabilities interacting with web pages, and uses audio descriptions, which may be new to some viewers. The always humorous Tommy Edison shows how he uses an iPhone. After watching this video, take a few minutes to watch one of his Blind Film Critic videos. While many people may think it is a noble goal, they may not be sold on the importance or value of accessible web design. These videos help outline why web accessibility is a smart, fiscally responsible decision. An engaging, jazzy (maybe too jazzy) introduction to web accessibility. While the references and statistics refer to Australia, the principles are universal. While a bit long, this video provides a very compelling case for accessibility from Administrators in higher education. If you are struggling to win over administrators at your institution, this is a must-watch. I had a great deal of difficulty finding tutorial videos that were accurate as well as timely. Although this video is not captioned, it was the most accurate and up to date video I could find. Many of the best videos for creating accessible content are provided by the company itself. A brief overview of how to use the “Make Accessible” wizard in Adobe XI. Adobe has an excellent “Accessibility Channel” for many of their tools. Unfortunately, not all of these videos are captioned. Do you know someone who thinks that YouTube’s “Automatic Captions” are the answer to their captioning problems? Show them this humorous video. Ironically, I was unable to find a good video on captioning YouTube videos. Is there a video that you regularly use that isn’t on this list? Please share it below. I am often asked by people if their institution has a legal obligation to provide web content that is accessible to individuals with disabilities. The short answer to this question is yes, but sometimes there is confusion regarding which laws apply to a specific institution. This post provides a quick glance at the three most significant laws regarding web accessibility in higher education–Section 508, The Americans with Disabilities Act (ADA), and Section 504. The information provided here should not be inferred to be legal advice. Anyone questioning legal obligations for their organization should consult with an attorney. In other words, if you receive federal funds, you cannot discriminate based on a disability. The Americans with Disabilities Act of 1990 is a sweeping piece of civil rights legislation that prohibits discrimination based on disability within employment (Title I), state and local governments (Title II), and public and commercial facilities (Title III). Because it became law in 1990, when the web was in its infancy, it does not actually mention the internet at all, but there are still ways that the ADA applies. Title II applies to state and local government, including public institutions of higher ed. It clearly states that communications with persons with disabilities must be “as effective as communications with others.” This is commonly interpreted to include web content. The Office of Civil Rights has defined effectiveness to include 3 components (OCR 09-97-2002.RES): (a) the timeliness of delivery, (b) the accuracy of the translation, and (c) provision in a manner and medium appropriate to the significance of the message and the abilities of the individual with the disability. You can see how providing an after-the-fact accommodation of the accessibility of a few limited pages of course materials could violate this provision. The DOJ has not provided any update on this ANPRM, but indicted that they will do so in 2013. It is currently the only place in US law that defines what constitutes web accessibility, so its standards may be used to determine accessibility by vendors who desire to conform to this provision and also in legal actions. This is not an endorsement of Section 508 and careful consideration should be made when choosing a technical standard for your institution. Some states (e.g., Arizona, Nebraska, Oklahoma, Wisconsin) have adopted Section 508, or a derivative, as state law, applying to state agencies. In some states, Higher Education is part of the state agency constellation. Many grants and other sources of federal funding require that materials created within the funding meet 508 standards (§1194.22 for web content). Yes, because basically all institutions of higher ed receive federal funds. For private institutions, currently being clarified. Section 508 as a law applies to Federal Government. Many grants and contracts with the government require that materials that are created meet Section 508 standards. So is it really the law? This statement leaves little room for interpretation. So my response to the question, “Does my institution have a legal obligation to provide web content that is accessible to individuals with disabilities?” is “Yes”. Both public and private institutions (that receive federal funds) have a legal obligation to create accessible web content. As part of my efforts with GOALS, as well as my work with WebAIM (a partner), I have had the opportunity to evaluate the accessibility of many websites across business, education and government. While certain issues, such as missing or inappropriate alternative text, seem to be common on many websites, I have noticed that some accessibility issues seem to be more frequent in Higher Ed. The following post outlines five of these issues, why I feel they are more common, and what can be done to address them. Larger text does not need as much color contrast. If you have a lighter school color, use it in headings, not in link or body text. If your school color is too light to use with a white background, see how it looks with a darker background. This might work especially well in a banner or menu at the top of the page, or in a footer. If a link is not underlined, there are only a small number of link colors that provide sufficient contrast between the main text and link text, and between the link text and background. The easiest way to address this is to underline your links. It must be accessible using only a keyboard. Users must be able to pause and resume the carousel. The information contained in the carousel must be readable by screen readers. It needs to be designed so that the user will not encounter problems if they are in the carousel when it updates. Many postsecondary institutions are composed of independent colleges and departments, and many of these groups like to show their independence with a unique web design. It is not uncommon to encounter dozens of different templates on a single institutional website, but with each unique layout comes unique accessibility issues. This is compounded by the high turnover at many schools (student employees are often used to design and maintain web content). While it might be possible to address this issue through training, we have found that institutions with a more unified design tend to be more accessible. Reining in a highly decentralized school can be difficult. We are housed at Utah State University, which has been working on this issue for a few years. We know firsthand the frustration that comes from having certain design limitations imposed on our work, but from an accessibility and usability standpoint, the benefits are worth the frustration. While Content Management Systems are fairly common on the web, Learning Management Systems (LMSs) are even more ubiquitous—they can be found at almost every postsecondary institution. LMSs allow individuals with limited technical expertise to create courses and post other content online. This can be tremendously helpful, but it can be very difficult or even impossible for students to access content in an inaccessible LMS. While we do not endorse a specific LMS, we have found several LMSs are constantly improving their accessibility, probably because of feedback from their customers. If you are in a position to influence your institution’s choice of LMS, ensure that accessibility is part of the selection process and that it is written into any requirements, documents or contracts. HTML content is typically more accessible than non-HTML content. It is also easier to evaluate and repair. Unfortunately, Higher Ed websites are often full of non-HTML content such as PDF, Microsoft Word, and PowerPoint files. This is probably due to the fact that much of the content on an institutional website is created by faculty and staff who are much more comfortable and familiar with these tools. While it would be ideal to see more HTML content on these websites, the reality is that many sites will continue to rely on non-HTML files for a great deal of their content. The next best solution is to provide training and technical support for faculty and staff that will be using these programs. We have found that the foundations of creating accessible Word, PowerPoint and PDF files can usually be taught in an hour or so. If training is not available, we have developed a series of accessibility cheat sheets that provide a brief overview on creating accessible Word, PowerPoint and PDF files, as well as the best ways to convert office files to accessible PDF. We will continue to develop new cheat sheets and hope these resources can provide support for non-technical content developers. Each resource is a single page, and is intended to be printed. We plan on presenting more resources soon, including a handout on captioning within YouTube.